Cloudstreet debuts tonight on Ovation at 10 p.m. Eastern. Given the information overload in which we live, it’s always nice to encounter something with which you have no prior information. Cloudstreet, the Australian miniseries premiering tonight on Ovation, is just that sort of pop culture item for yours truly. Having no preconceptions about a work means that one is open to anything and everything that might occur, and that’s probably the best way to approach this sprawling tale of two families living in the same house over the course of two decades. But while this story theoretically takes place over twenty years, it also takes place between two breaths. That compression of time and place is indicative of the work as whole. Like the Tim Winton novel upon which this series is based, Cloudstreet is less concerned with the destination than the circular journey depicted therein. This is a feature, not a bug, however. Cloudstreet isn’t particularly interested in story so much as mood. That’s not to say that nothing happens in the six-plus hour running time of the series. But what happens is often incidental and subservient to what it means. The story concerns two families brought together through tragic circumstances to a single dilapidated mansion in Perth in 1943. The Lambs are a religious family that derive power from their spirituality and a work ethos instilled by their mother Oriel (Kerry Fox). But that faith gets tested almost immediately due to a fishing accident involving their youngest son Fish (Tom Rusell, Hugo Johnstone-Burt). Meanwhile the Pickles subscribe to what is referred to as the “shifty shadow,” or what we might refer to as “luck.” Pickles patriarch Sam (Stephen Curry) takes this belief and eschews hard work in favor of passive activity punctuated by gambling fits, based upon his perceived place on the continuum of fate. After a boating accident leaves Sam partially crippled, he soon takes his family to a house on the titular street, inherited from their late cousin. The conditions of the will ensure that Sam cannot sell the home for twenty years, and rather than find work he soon rents half of the home to the Lambs in order to make ends meet. The duality of the house reflects the duality that spreads across all of Cloudstreet: The backyard soon springs to life on the Lambs’ side as they till the land and produce crops to sell in a store they establish on the first floor. Meanwhile, the Pickles’ side stays barren, the result of their desire to consume rather than nourish. But the duality on the outside is blurred and marred by the equally distributed rot on the inside: The home that the two families share not only reflects the emotional turmoil of the two families, but also the tortured history of Australia itself. Cloudstreet shares the same appreciation as Cincinnati for the extraordinary seeping into ordinary life, but is a much more approachable affair that that controversial, opaque David Milch experiment. The more magical aspects of Cloudstreet gradually seep into the proceedings as a pace so slow you’d be forgiven for mistaking their introduction as art-house pretensions. But director Matthew Saville and cinematographer Mark Wareham film the house (and by extension, Australia as a whole) as a living, breathing organism in an internally logical manner. It’s never clear if the house affects its inhabitants, or vice versa. I like the idea that both affect each other depending on the particular circumstances. Through both Blackfella and sparsely deployed omniscient narration, we learn about the history of the house, which in turn sheds light on not just the familial histories but also on some of the more unfortunate treatment of aboriginals in 20th-century Australia. No one in the house truly understands the history embedded in the walls, but they certainly feel it at all times. Heck, Oriel feels it so much that she actually starts living in the backyard at one point, and stays inside that tent for the better part of the miniseries’ length. At the epicenter of the story lies Fish Lamb, the boy at the heart of the tragic accident that kicks off Cloudstreet. The accident (if, indeed, anything is an "accident" within this world) has left him mentally incapacitated, but also stuck metaphysically between this world and whatever lies beyond. Through him, we get a better understanding of the history of the house, the families therein, but also humanity’s position in the grand continuum of the universe. When Saville shoots Cloudstreet through Fish’s eyes, the series takes off into realms of almost unspeakable beauty. 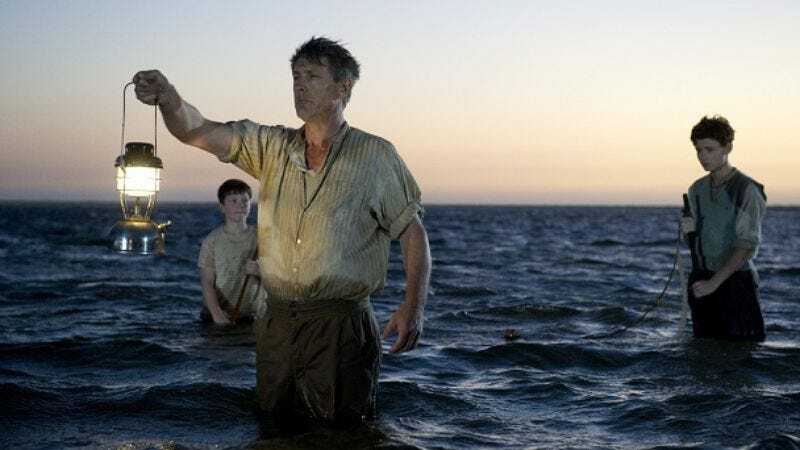 There’s a scene in the second hour in which Fish’s older brother Quick (Callan McAuliffe, Todd Lasance) takes him out on the river in order to deliver a found rowboat home. (It’s too heavy to carry on land.) As they slowly make their way back, the line between the water and sky soon dissolve, along with the line between the earth and heavens, and soon the pair are literally rowing into the heart of the cosmos itself. Again: You either roll with this or you roll your eyes at this. But Cloudstreet pulls off this tricky task with such casual ease at times that it’s hard not to be swept up in its audacity. Other, more earthbound aspects remain problematic throughout, however. While Cloudstreet attempts to depict a sprawling, multi-family, multi-generational storyline, it doesn’t have enough running time to truly make all characters three-dimensional. There’s a death about two-thirds through that completely shatters one character, but the relationship between that character and the deceased never really played out onscreen. This oversight leaves a gap between the character’s reaction and the audience’s in a way that makes a lot of that final third play poorly. It’s a curious oversight, one that stands out like a sore thumb considering how well the show does so much of what it attempts. And while the show eventually explains the horrid, rancid behavior of Lambs’ matriarch Dolly (Essie Davis), the explanation comes a little too late with a little too much melodrama to justify the overkill of scenes in which she systematically attempts to eliminate any bit of happiness in her life. Still, Dolly also is one-half of possibly the most powerful scenes in the entire series, a moment of reconciliation between two characters that have no earthly right to have common ground at all. And ultimately, Cloudstreet concerns itself with those moments of beauty for which there is no rational explanation. That can make it tough to provide an accurate, psychologically sound close reading of each choice of each character. But more often than not, the decisions made in this miniseries feel right, and this is a work all about conveying those feelings intuitively without needing the need to fully articulate them. By the time the miniseries winds its way back to its initial images, we’ve arrived back to the same place but understand it anew. It’s a very T.S. Eliot way of approaching things, but since Four Quartets is also my jam, I didn’t mind this circular approach in the slightest. Cloudstreet rewards patience, but patience is something you will have to employ in order to make it through some of the muddy patches. The first hour, in which the two families slowly make their way to the home, is probably its weakest, and there’s a long stretch in which Rose Lamb (Lara Robinson, Emma Booth) dates a wanna-be author that is essential to her arc but also brutally dull. However, there are enough inspirational flights of fancy, visual flair, emotional heartache, oddly arch humor, and simply breathtakingly human moments to overcome those dramatic valleys. This miniseries won’t be for everyone, but those that connect with it will be rewarded with some experiences most television simply can’t provide. Posting this review before it airs means you hopefully have time to figure out where the heck Ovation is on your dial. I’ll confess I had no idea until needing to locate it in order to review We’ll Take Manhattan a few weeks back. The narration deployed seems random at first, but as soon as you realize who is supposed to be delivering it, its inclusion makes much more sense. While the dialogue is prosaic, the narration is full of lyrical fancy, lifted directly from Winton’s novel. It’s not jarring, but it does make me curious how this dissonance plays out in the book. While it may be frustrating to not have the house’s history ever fully explicated, I love that Cloudstreet didn’t feel the need to include clunky in-scene exposition. All you need to know about it unfolds onscreen by the end of the miniseries. Fish “communicates” with the spirits of the house via a piano left over from the original tenant, and the resulting dialogue sounds like an outtake from Radiohead’s Amnesiac album. There’s a story in the third hour about the way in which both matriarchs ruin a family’s life in concert without realizing the other’s part in it. In terms of selling how closely intertwined the Lambs and Pickles become, that might be the strongest example in the miniseries. It’s easily the most poetic. Nearly every scene between Oriel and Quick is absolute gold. It’s easy to forget that Fox actually plays two of her biggest scenes against two different actors playing Quick, since her character’s love for both is so seamless.